New poster here from central Maine. Thanks to this forum, I made a new saw purchase today. I've owned 4 different Husky's over the last 20 years and use them on my 10 acre wooded piece of property. My last was a 357XP which I had proudly owned for 8 tanks of fuel, then it was stolen out of my garage. I went without a saw for 2 years and just couldn't take it any more. I have too much land maintenance to do this spring. My original plan was to cheap out on things and get a mid range saw "to get by" with. Well,,,after reading a bunch of threads on this forum, and about 2 minutes of hymming and hawwing in the Husky dealer and over $700. dollars poorer, I now own my 5th Husky. A 562XP. All I can say is I'm flabbergasted after bringing it home and running a half a tank through it. 2 pulls and it was started. Idles perfectly,throttle response is unreal, runs like a scalded dog,no smoke, and feels more comfortable than my beloved 357XP. Yes, I ran it hard. It's only 45 degrees out, so overheating isn't a problem. This saw is just miles better than what I have ever used. Thank you to all the users on the board that contribute to good posts. It made my selection process easy. Jay. schmeg,welcome to the forum. What town in central Maine? I have a 372. Hope that will last me a while longer. I live in Glenburn. Just west of Bangor. I own and live on 10 acres on Rt.221. Mix of spruce, pine, and some maple. I've been selectively cutting on my land for 21 years now. I retire in 2 years which will give me more time to dabble in the woods. I need to buy a tractor now. There are a couple members up your way. A tractor is nice to have. I've heard a lot of god things about the 562. I'm waiting for the 595. I'm just so used to what I used to run. I always considered my 357XP to be all the saw I would ever need. 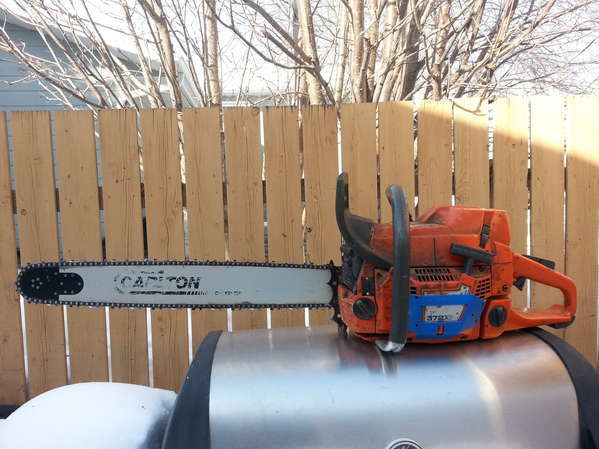 This new saw was the same kind of jump as when I went to a fuelie 2 stroke 800 sled vs. carbs. All together different feel. What floored me right off the bat was a stone cold saw running like it was already warm. The vibes are a lot less too. Can't wait to go out and burn a few tanks up. Welcome to the forum! I bought my 562 last fall there a great saw I ran the crap out of it this winter between 6 and 7 hundred cord cut with it so far and it hasn't skipped a beat all I have replaced is a bar last week and I've cleaned the air filter about once a week I'm definitely buying another one this summer or fall! You bought a great saw, Congrats! Thanks all. I'll never equal 700 cord, but I cut as a hobby on my land. This saw is way more than I will ever need power wise. I do have a dumb question. I noticed a fair amount of saws utilize catalytic converters now. It doesn't appear that my 562 has one. Am I assuming right that the autotune allows the saw to pass EPA without the use of a cat? "Been there, done that........and still learning"
Husqvarna's X Torq fresh air strato charging design is what makes their engines pass EPA regs . Strato charging without catylatic mufflers is the flavor of design for the big saw companies today. Making a living with a saw since age 16. Thanks. I'm somewhat familiar with stratified charges in the combustion process. It is used in some snowmobile engines also. Now I just have to get used to the saw and put time on it. I also need to figure out what the best chain/bar combo to use on it. I run a 18" b/c on my 562 and it's perfect for me. I have a 372XP-24" for longer reach and more power. But seeing your 562 is your largest saw I suggest you should run 20". The saw came with an 18. I have 9 working chains of that length right now. All 3/8 .58. Maybe I'll look into a 20 for bigger stuff of which my large stuff is 50-70 year old black spruce and some white pine. My hardwood is mostly 12" or less. Great saw, had to run the 55 to free a pinched bar and I went back to the 562 as soon as I could. If he doesn't have any trees over 36" why bother with a 20" bar? But I don't know what his trees are like. I would say have two bars for that saw, and put the longer bar on only when needed, if needed. I have a cookie from a black spruce that is 200+ years old and is around 7"
Just stick with the 18" then as I now see what size of timber your in. I used to log with 18 on a Stihl 064 in 12-20" average timber and I could put up a lot of tree length in a day. Felled limbed and topped. In the bigger spruce pushing upwards of 24-30" I'd run 20". The 562 will handle a 24" b&c in pine with no problem. the 562- 24" is too slow for me plus the poor balance turns me off......thats where my 372XP with 24" comes in. Before I had my Stihl 460 I had a 24" that I would put on the 361 for the rare occasion I needed it. It did ok and got the job done, but now if I need that bar length the 460 is wearing it. Much better suited to the task. 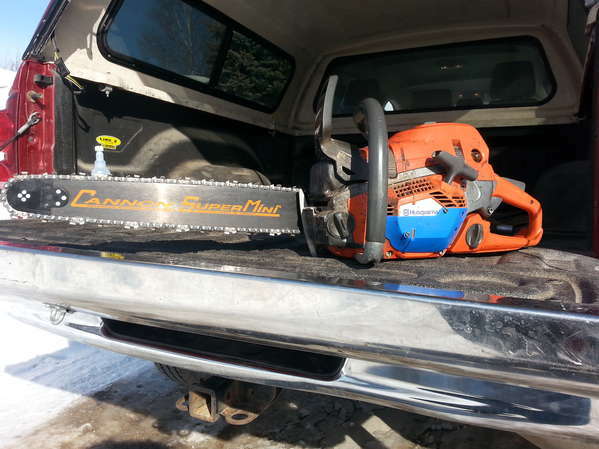 Have you noticed any issues with hesitation when coming off idle or trouble with warm restarts since owning the saw? I know there was a thread here discussing it and it seemed many owners of the saw were having the same problems. This is an AutoTune model, correct? Also, I just went on a popular shopping website with a "rainforest name" and see they are selling Husqvarna 562xp's! Showing the price also! Yes, its an autotune and that technology works perfect. Understand the Autotune only works on the high speed circuit, so the slow speed left to its own devices which is lean for EPA reasons which is why the saw has a stalling problem. Some people claim changing the carb will fix the issue, but that is probably due to jetting differences (tolerances) from carb to carb. Thats why it works for some people and not others. If you are a climber, I would look elsewhere. On the ground, I wouldn't worry about it. Its more of an occasional annoyance than anything. Hopefully there will be a fix soon. I would buy the saw again if given the chance. I also would give the MS362 CE a closer look. But I understand they have their issues too. Welcome and yes the 562 XP does run like a scalded dog. It goes from zero to 60 faster than any saw I ever owned. Thanks for the answer. I have a 545 AT and it's great especially when I'm changing from home altitude of 1000 ft to 8000 ft at our cabin. I just heard complaints from the 562 AT owners. I'm a firm believer in electronic engine management. The balance is way off with a 24 "bar. I bought a 24" bar and put it on and picked the saw up and set it back down and took the bar off. Yes, the 372 XP handles it with ease. Lol I guess us west coast boys don't understand balance. I run a 24'' on my 562xp and a 28'' or 32'' on my 385xp. Lol, west coast balance means nothing for the application in this thread. 1. Saw doesn't bog at all after start-up and for first few minutes of operation. Runs real clean. 2. Once the saw is up to temp, it won't bog if it idles for less than 5 seconds. 3. If you let the saw idle for a couple of minutes, it bogs bad for a split second then either rips hard or stalls. Not much smoke, but some when it revs up, so it acts more like the saw is loading up than leaning out, but it actually could be a little of both. 4. Outside of this small issue which can be annoying at times, this saw runs like a motocross bike with a bar attached to it. Schmeg, when I bought my 562 new after some use it started to give some erratic behaviors. I put a new spark plug in and has been running good ever since. I'm heeding over to the saw shop tomorrow to pick up my 2 year old grandson a plastic chainsaw so he can help me with cutting this weekend. I'll pick one up then and give it a try. Seeing the saw is new you still have warranty on your side if worse case scenario the plug doesn't help. Well, I went in for a plug today. I discussed the bog issue with the owner of the shop. He said that Husky is coming out with a new carb later this spring. If the saw still has the issue when the carb comes out, he will replace the carb under warrantee. When I brought this up, he was well versed in the problem. He stated some saws do it, some don't. I'll be trying the new plug later today. New plug didn't do a thing. These problems are often misinterpreted on forums like this. Only a very small number of the saws have a carb with this issue. But the pending arrival of a new carb leads some to the mistaken conclusion that all of the EL-46 carbs have the same issue. If your saw is actually bad enough that it will stall, another of the current carb can be installed and the problem will most likely disappear. It's not like you have to live with the problem until the new carb is available. Did the dealer plug it in and hit the fuel setting reset? Some other mis-information in this thread: AT does NOT only work in hi-speed. There is no manual Lo speed mixture or even an idle adjustment screw. The entire RPM range is controlled by AT and the throttle position sensor. It is often possible to create some slight hesitation on an otherwise perfectly running saw by frequent and unecessary throttle blipping between cuts. I discovered this as I'm one of those chronic throttle blippers that's annoying to be around. How about when you shut the saw down to move limbs, does it fire right back up easily? I was thinking the same too Spike. Seeing I noticed the OP mentioned earlier he was "trying to bog" the saw. Re-starts are good. It always fires right up with or without high idle. The only issue is a lean spot just off idle. I flooded it yesterday during the cold start, but that was probably my fault. I'm interested to see if the saw works out of this with more use. After all, its only had a total of a half gallon of fuel put through it. I understand sometimes they work out of this issue. jay. Jay, did you do the 5 minute at WOT in the wood as the owners manual instructs? "Doc, if I press right here it hurts." "Then don't press there anymore." Oooops, meant to quote Holmen's post. How do you delete this? ?? Yes I did, Laid right into a nice cherry stump. I've been making cookies on it ever since day one. Went out and sawed up a little bit today after work. Just a tank full. OAT is 50ish F. It seems the bog is there all the time regardless of idle time now. Once the saw spins down to idle, then when you trigger it up to full throttle, it will bog, or feel lean until it gets spinning. If this was my EFI snowmobile, I would just plug my laptop into the Powercommander and add a few points to the fuel table at that RPM and throttle position. Anyone ever hot wire a a fuel module to a saw? I have 661 new ones purchased in the summer, then I bought 550 xp already used but it works almoust like a new one. It had only 4 minutes of work. In the fall, I purchased 192T and the 201T, in excellent condition . In September I bought a 2077 turbo in perfect condition. Now I want to buy 562 xp, and I’ll stop on that for now. By the way, in Romania 562 xp you can buy a new one from the store for 500 euros. We use ours with 16in bar. Perfect balance. Any thing longer is like having a horse dong. Looks flash but you want something thats works well and is easy to handle all day long.Struggle to see Husqvarna recommending a long bar for the saw. If anyone can I would love to read Husqvarna's response email on this issue. New 562XP with AutoTune...... ??? Page created in 1.062 seconds with 39 queries.